Anything the girls can do, it seems Connor also wants to do. 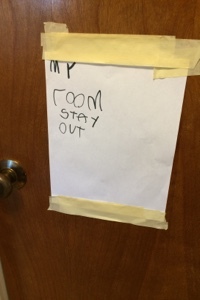 For years now they have being posting notes on their bedroom door so it was no surprise last weekend when the following appeared. He did write it himself but he found that phrase in a book, I think he did a great job of transcribing it for a 5yr old. I guess that Randy was about Connor's age when we were in England the first time. By that time, three of his older siblings were in school. We came home and tried to share/teach some of what we'd learned in school. Dad had put up a chalkboard in the kitchen and Mom had taught him how to write the alphabet--not sure, but he probably could recite it, too. As an example of what he learned, ask him to tell you the All Bran story!